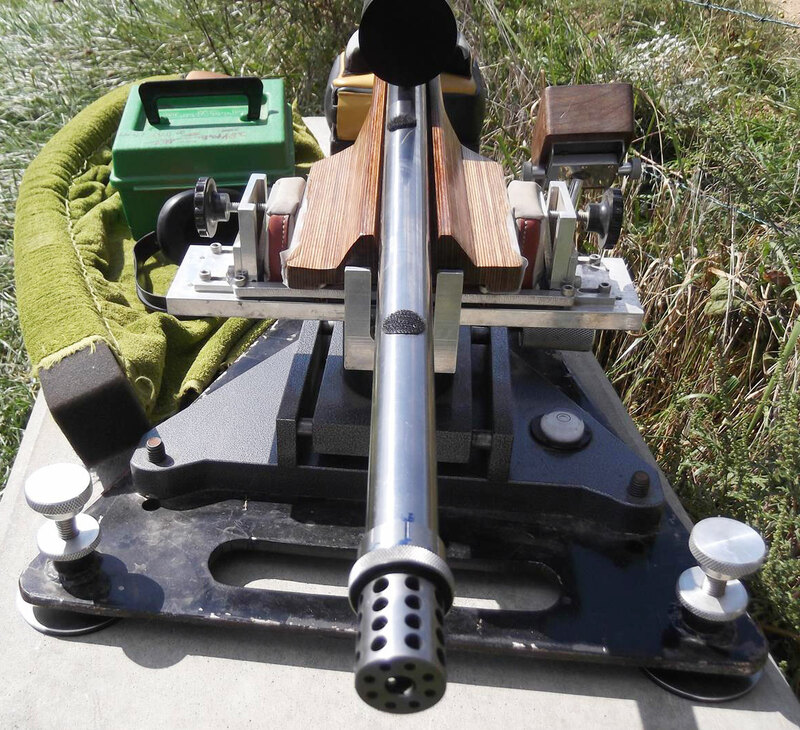 The IBS 2016 Long-range shooting season is starting soon, so we thought our readers might enjoy learning about a state-of-the-art 1000-Yard Benchrest rig. 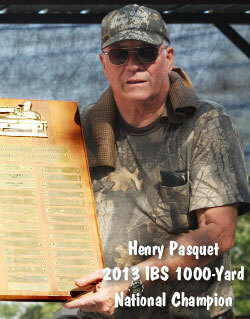 This article features the impressive .284 Shehane Light Gun used by Henry Pasquet to capture the 2013 IBS 1000-yard Nationals. With a 5″-wide “hammerhead” front and a special 3″-wide bag-rider plate in the rear, this 17-lb rig is ultra-stable in the bags, and tracks like a dream. 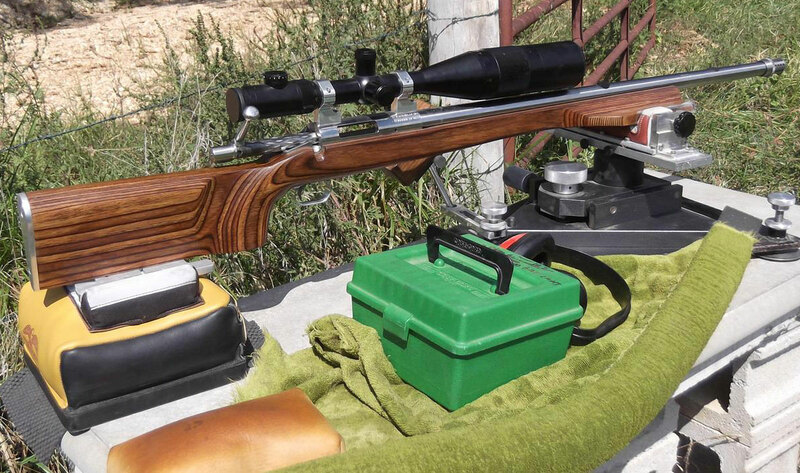 In this story, Henry explains his set-up plus his processes for loading super-accurate ammo. Every long-range shooter can benefit from some of tips revealed here. And F-Class guys — if you’re shooting a .284 Win-based case in F-Open you should definitely read Henry’s precision reloading advice. EDITOR: Guys, there is a ton of solid gold information in this article — take your time and read it carefully. Q: First, do you have any advice for older shooters getting started in their golden years? Henry: You’re never too old. In this sport, you can excel even in your 60s, 70s and beyond. At this stage in life, we now have the time and money to get good equipment and rifles. Plus, our years of work experience help us to think, analyze, and thereby make progress. In this game, we older guys can definitely compete on a par with younger shooters. 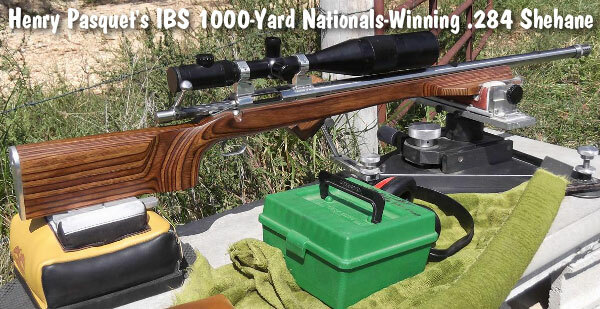 Q: Tell us about your Nationals-winning rifle and bench gear. Is there anything unique about your hardware that gave you an edge? Henry: At the Nationals, I used my 17-lb Light Gun for both Light and Heavy Class. 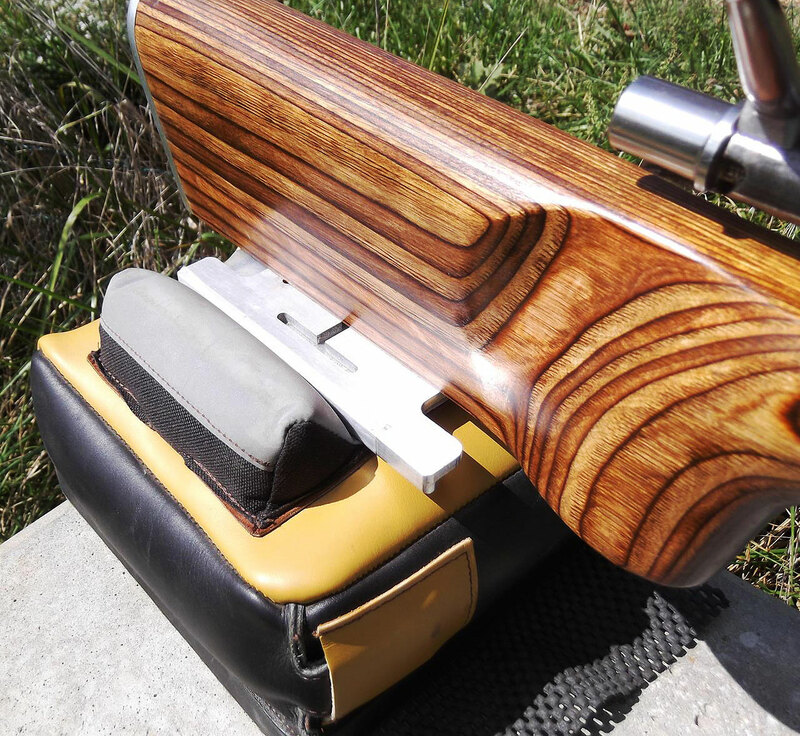 This rifle has a 1.55″, round BAT LP/RE action, fitted with a Bartlein barrel chambered for the .284 Shehane (an improved version of the .284 Winchester). The barrel was near-new; this was the first time I had used it this year. A great barrel and great batch of Berger 180gr VLDs all made a difference. Jay Cutright chambers my barrels. Jay’s metal-work is so precise that I can screw any barrel he’s chambered to any BAT action I own. The laminated stock was modified by Tommy Shurley from a standard 3″-wide fore-end to a 5″-wide True-Trac with an adjustable 3″-wide rear plate. It’s not pretty but it tracks like a Heavy Gun stock. Tommy made my other stocks as well. On top is a Nightforce 12-42x52mm Benchrest scope with CH-3 reticle. 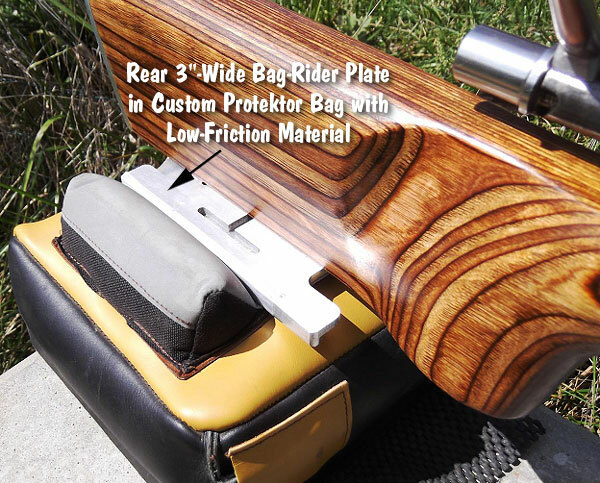 I used a Fulghum (Randolph Machine) front rest with an Edgewood bag made with the low-friction 3M material. In the rear I use a special-order Protekor rear “Doctor” bag with ears spaced 3 inches apart. 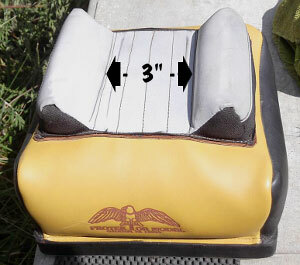 The rear bag also has the new 3M material on contact surfaces (photo at right). Q: During the Nationals, at the last minute you switched guns. Why did you go from a 6mm Dasher to a 7mm Shehane? Henry: I had planned to use my Light and Heavy Dashers, but after placing the Dasher on the ready line, decided to switch to the .284 Shehane. It was still early in the morning and I felt that the heavier bullets would be easier to see against the berm. The Dasher had actually been giving tighter groups under perfect conditions, but seeing the impact is important. 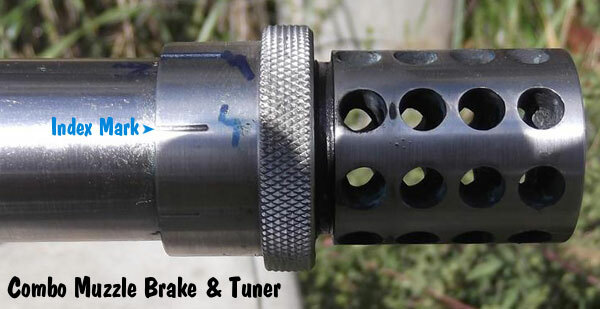 Q: Tell us about the combined tuner/muzzle brake on some of your barrels. 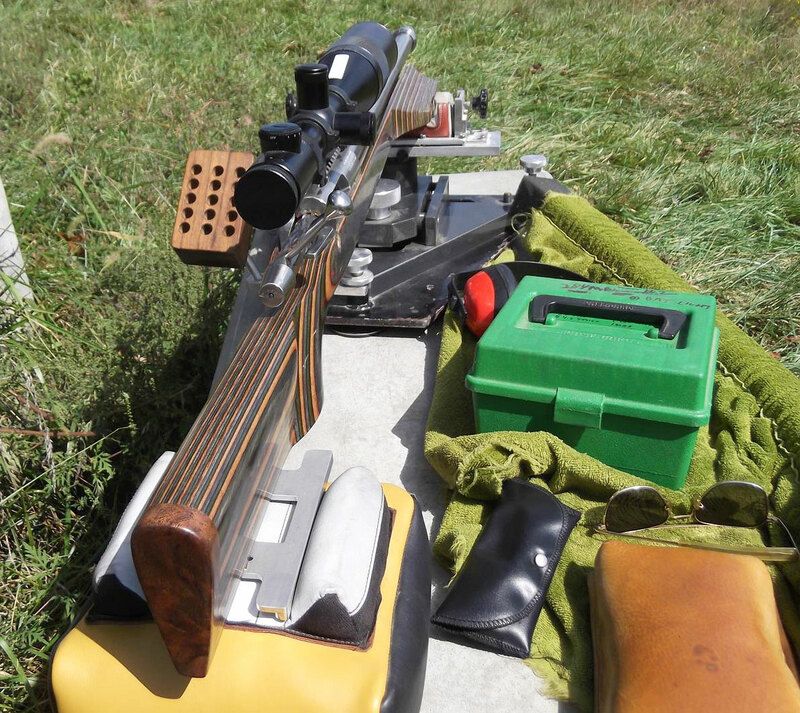 How does this improve rifle performance and how do you set the “tune”? Do you tune the barrel to the load? Henry: I use a tuner or tuner/brake on every barrel. I started with Time Precision tuners. Art Cocchia advised getting a load with a good known accuracy node with minimum extreme spread, which controls vertical. Do not go for the hottest loads, which just reduces brass life. Then use the tuner and tune the barrel to the load. The .284 Light Gun needed a muzzle brake and tuner. I had a local gunsmith cut a thread on the muzzle brake for a tuner I got from Sid Goodling. (Eric Bostrom developed an almost identical unit at the same time. I use Eric’s tuner/brakes on all my new barrels.) Just before Nationals, I tried going up and down one marker. Down one mark cut the group in half! Think how much range time (and barrel life) that saved me. Using a tuner is easier than messing around changing loads and tweaking seating depths. Tuners definitely can work. 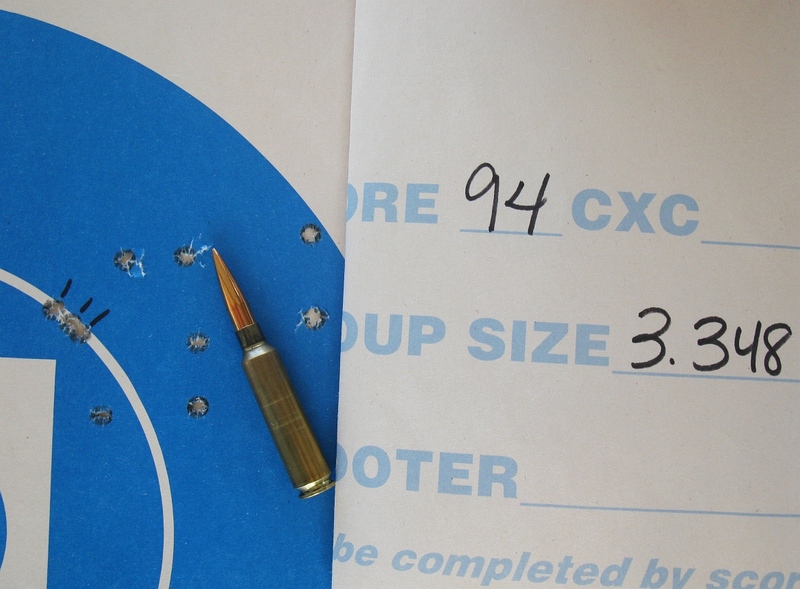 Last year I shot a 3.348″ 10-shot group at 1000 with my .284 Win Heavy Gun fitted with a Time Precision Tuner. Q: What are the advantages of your stock’s 5″-wide fore-end and 3″-wide rear plate? Is there a big difference in tracking and/or stability? Does the extra width make the rifle easier to shoot? Henry: I had true Heavy Guns with 5-inch fronts and 3-inch rears. They tracked well. I felt the same result could be had with a Light Gun. I talked two stock makers into making them. I initially had the standard rear stock until Tommy Shurley and Mike Hearn came out with an adjustable rear plate. The stocks track perfectly. You can see your scope’s crosshairs stay on the target the whole time and push the rifle back for the next shot. There is no torquing (gun wobbling) when cycling the bolt. Us old guys need all the help we can get. I am getting rid of my 45-pound Heavy Guns and replacing them with Light Guns with heavy barrels. Q: Some people say the .284 Shehane is not as accurate as the straight .284 Winchester. You’ve proved them wrong. Why do you like the .284 Shehane? More speed, less pressure? Henry: The reason I rechambered my 7mm barrels to .284 Shehane was not velocity, pressure, or brass life. It was all about bolt lift. My straight .284 almost required me to stand up to eject brass. I damaged an extractor and had to send the bolt back to BAT. With the .284 Shehane, my bolt cycles like there is no case to eject. Q: People want to know about your load and your loading methods. What can you reveal? Henry: For my .284 Shehane at the Nationals, I loaded 52.5 grains of Hodgdon H4350 and Federal BR-2 primers behind Berger 180gr VLDs. I usually anneal the brass each winter. I have used the same brass for years. I use Redding bushing dies, apply Imperial sizing wax, resize, wipe off wax, clean and uniform the primers pockets using the RCBS Trim Mate Case prep center, then apply Imperial dry neck lube with a bore mop. To dispense powder, I use a RCBS ChargeMaster set 0.1 grain below my desired load and then weigh them on a Sartorius GD-503 magnetic force restoration scale to get identical charges. 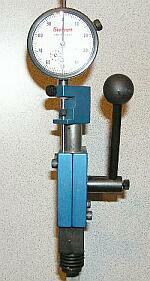 I use a K&M Arbor Press with seating force gauge when seating the bullets with a Wilson inline die. My “target” seating force on the K&M dial is 20-23 units for Dashers and 35-40 units for the .284 Shehane. I put any variables aside for sighters. I do not weigh brass, bullets, or primers. My bullets were so consistent that I did not sort by bearing surface. I did trim the Berger VLDs to the shortest bullet length with a Hoover Trimmer, and then pointed the meplats just enough to close them with a Whidden pointer. I sort my bullets to 0.005″ overall length, rejecting about five percent. Q: What kind of precision are you looking for in your reloads? Do you trickle to the kernel? Does this really help reduce extreme spread? Henry: I try to keep my charge weights consistent to one kernel of powder. I use the Omega powder trickler with a Sartorius GD-503 lab-grade balance to achieve that. For accurate dispensing, put very little powder into the Omega so you can drop one kernel at a time. Single digit ES (Extreme Spread) is the goal. This does make a difference at 1000 yards. If you get the same push on the same bullet with the same neck tension, good things are going to happen. Q: You believe consistent neck tension (i.e. grip on the bullet) is really important. What methods are you using to ensure consistent bullet release? Henry: I apply Imperial dry neck lube to the inside of my case-necks with a bore mop. The K&M arbor with seating force gauge shows the need to do this. If you put a bullet into a clean case, it will be jerky when seating the bullet. You may see 40 units (on the K&M dial) dropping to 20, then slowly increasing pressure. I explained to a friend that not lubing the neck is like overhauling an engine without lubing the cylinders. Smooth entry gives the bullets a smooth release. Q: You go 60-80 rounds between cleaning and the results speak for themselves. What is your barrel cleaning procedure? Do you think some guys clean too often or too aggressively? Henry: I cringe when I see people wearing out their barrels with bronze brushes between relays. I clean my barrels at the end of each day when I get home. I shot my best-ever 1K Heavy Gun group (3.348″) at day’s end after 60 to 80 rounds. 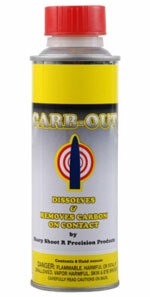 After trying other solvents, I have gone back to Wipe-out’s Carb-Out and Patch-Out products. I use about four patches of Carb-Out, let it sit a few minutes, then use one stroke of a nylon brush followed by Patch-Out until the barrel is clean. I use a bore mop to clean inside the chamber, then some Break Free LP on the bolt followed by bolt grease on the lugs and cocking part. I use a bore guide when anything goes down the barrel. Q: Henry, you can shoot long-distance on your own property in Missouri. How important is practice, and what do you do during a typical practice session? Henry: I can shoot 1000 yards on my farm. I have a concrete bench using a slab from a yard furniture place on concrete blocks. Two 4 x 8 sheets of plywood hold four IBS targets. I never practice. I only test, keeping a notebook with all the info. I do most of my testing at 300 to 500 yards, shooting off my deck so I can see my shots immediately. Q: How much of your success do you credit to really accurate rifles, versus superior shooting skills? Henry: I do not consider myself another Carlos Hathcock or some master marksman. 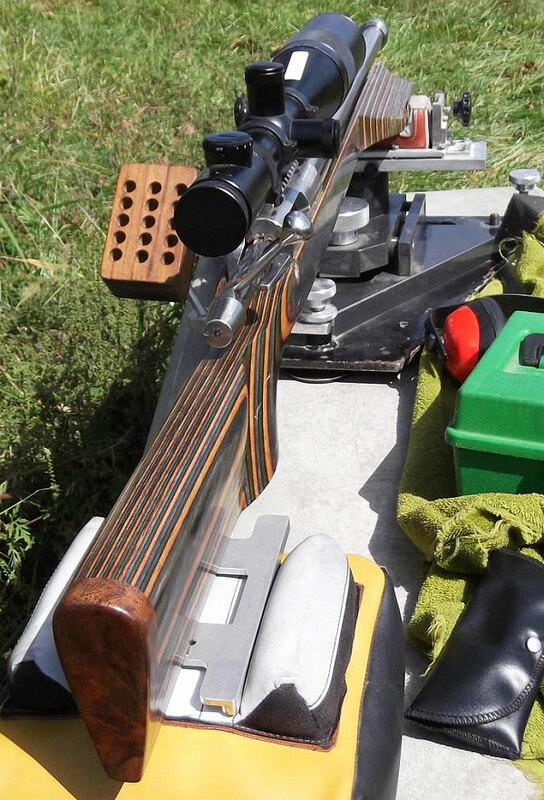 I am an average 1000-yard shooter, but I do work hard getting the most out of my rifles. Four other people have shot their first 1000-yard matches with my rifles, including my wife, and all of them won relays! I loaned my Dasher to another shooter two years ago and he got second at the 600-yard Nationals. Others will tell you that the rifle must be “on” to win. If your barrel or bullets are average, don’t expect to perform above average in competition. 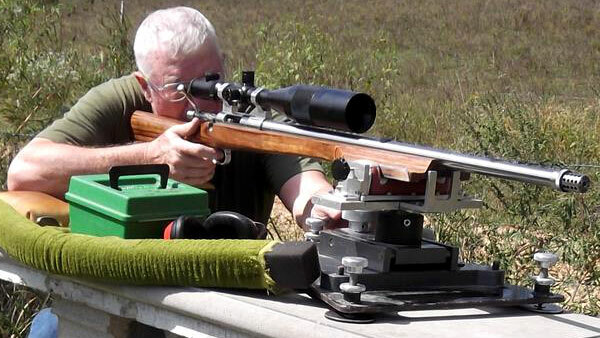 Q: What you do enjoy most about long-range benchrest shooting? What are the attractions of this sport? Henry: The sport offers good people and a real challenge. 1000-yard shooting keeps us all humble, but we still keep trying to see how good we can do. I am thankful for Robert Ross providing the only match location that I can shoot regularly. Q: Henry, you have been a Forum member for many years. Have you learned important techniques from other Forum members and other shooters? Henry: I have followed the AccurateShooter Forum since 2008. At my age I am not good at computers. I copied and analyzed many articles, especially on the .284 and the Dashers. Without AccurateShooter.com, I would probably still be shooting double-digit (10″+) groups at 1000 yards, and I sure wouldn’t have my name on a National Championship trophy. Q: You are in your 70s now and have only been shooting competitively for a few years. How did you get so good so fast? How did you manage to beat shooters who are decades younger? Henry: I had 20/10 vision when I was young, but am down to only 20/20. I have been interested in long range shooting for a long time including ground hog hunting. I went to some VHA jamborees also. In 2008, I went to the Williamsport Benchrest School with a friend from Pennsylvania, John Haas. We would compare notes frequently. I bought a BAT three lug from Tom Mousel in Montana. We also compared notes and made each other better. At IBS matches I studied other shooters’ equipment and techniques. I tried some, accepting some and rejecting some. Always be ready to learn something new. If it makes sense, try it. I would also encourage other older shooters not to quit. Stick to it. You can make enormous progress in a few seasons. 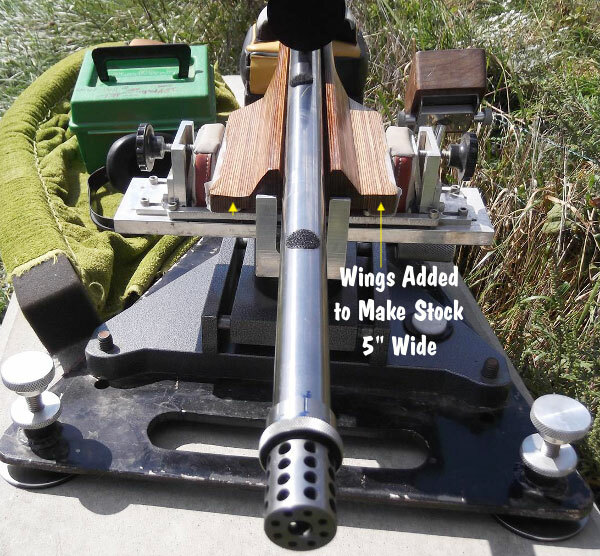 Share the post "1000-Yard Benchrest State of the Art .284 Shehane"
Whidden Gunworks makes great sizing and seating dies. The Whidden full-length sizing die with neck bushing is very popular because it allows you to “tune” the neck tension by using different bushings, with larger or smaller inside diameters. In this video, John Whidden explains how to choose a the right bushing size for use with your neck-sizing and full-length sizing bushing dies. For most applications, John suggest starting with the caliper-measured outside diameter of a loaded cartridge (with your choice of bullet), and then SUBTRACT about three thousandths. For example, if your loaded round mics at .333, then you would want to start with a 0.330 neck bushing. John notes, however, that you may want to experiment with bushings, going down a thousandth and up a thousandth. 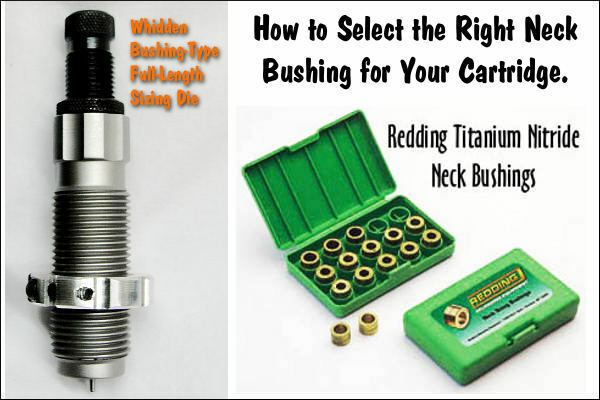 With thin In addition, as your brass ages and the necks harden, you may want to change your bushing size. You may also want to experiment with “flipping” your neck bushings to alternate the side that first contacts the neck of the case. (One side of the bushing is usually marked with the size, while the other side is unmarked.) So try “number side up” as well as “number side down”. 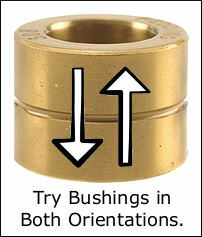 Some folks believe that one side of the bushing may allow a smoother entry, and that this can enhance concentricity. Other people think they can get very slightly more or less neck tension depending on how the bushing is oriented. This is a subtle effect, but it costs nothing to experiment. If one bushing orientation proves better you can mark the “up” side with nail polish so that you can always orient the bushing optimally. NOTE: We have confirmed that some bushings are actually made with a slight taper. In addition, bushings may get distorted slightly when the brand name and size is stamped. Therefore there IS a reason to try both orientations. 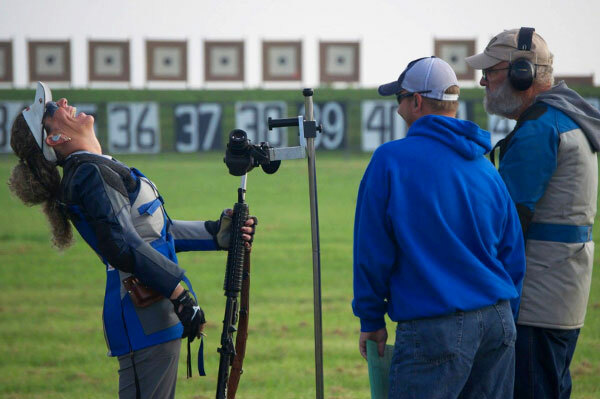 Share the post "Whidden Explains How to Find the Optimal Neck Bushing Size"
Online registration is officially open for the 2016 NRA National Rifle and Pistol Championships at Camp Perry, Ohio. Held July 11 through August 9, 2016, the National Matches attract the nation’s finest civilian and military marksmen who will participate in a month of competitive shooting on the shores of Lake Erie. From pistol, to smallbore rifle, high power rifle, and long range high power rifle (including F-Class), the national matches have something for just about every serious shooter. As usual, the pistol, High Power, and High Power Long Range Championships will be held at Camp Perry, Ohio, on the shores of Lake Erie. However, the NRA National Smallbore Position Championships and Smallbore Prone Championships will be held at the Chief Wa-Ke-De Range in Bristol, Indiana. 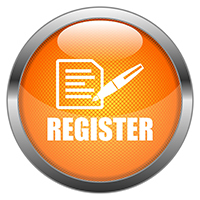 This year’s Smallbore Championships are scheduled for July 10 through July 18th.